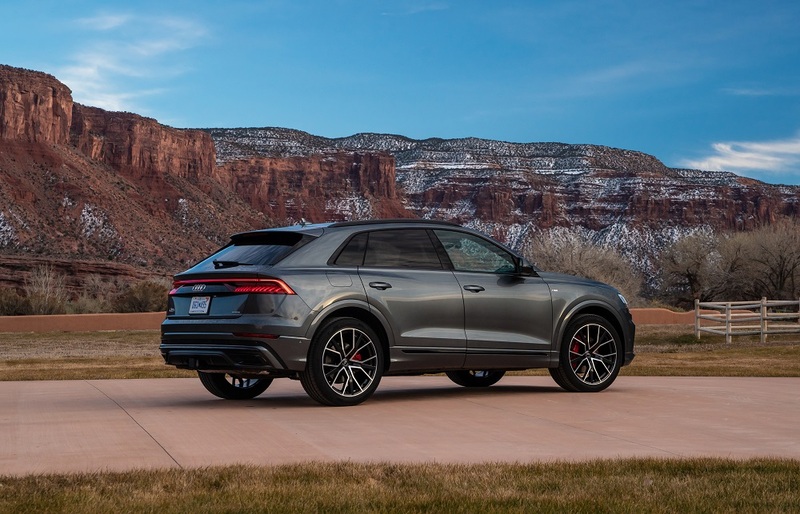 The 2019 Audi Q8 was awarded a 5-Star Overall Safety Rating - the highest possible overall rating - from the National Highway Traffic Safety Administration (NHTSA). - Standard Audi pre sense front, which helps detect vehicles, pedestrians and cyclists in the vehicle’s forward path at speeds of up to 52 mph and can initiate braking if a potential collision is detected. - Available Intersection assist helps monitor cross traffic when pulling through an intersection or crossing lanes and can help notify the driver of a potentially hazardous situation by a brief braking to warn the driver at speeds of up to 6.2 mph or with visual and audio warnings at speeds of up to 18.6 mph. - Available Adaptive Cruise Assist (ACA), a "hands-on" system that helps the driver with acceleration and braking, maintaining speed and following distance, and with lane tracking over a speed range of 0-95 mph and during traffic jam situations. - Available Top view camera system (front, rear and side views) with virtual 360˚ surround view combines four wide-angle cameras on the outside of the vehicle to project a virtual real-time 3D model of the Q8, allowing the driver to toggle around the vehicle and zoom in and out to help with maneuvering in tight spaces.